What Are the Signs Alcohol Withdrawal Treatment Is Needed? Detoxing from alcohol is often the first step in the rehabilitation process for people with significant levels of alcohol dependence. Left unmanaged, heavy alcohol users may experience uncomfortable and potentially severe alcohol withdrawal symptoms when attempting to quit. The acute alcohol withdrawal syndrome may range from mild to physically dangerous, and may include symptoms such as irritability, anxiety, agitation, increased heart rate, high blood pressure, seizures and in rarer cases, delirium tremens. A supervised, medical detox can help people avoid unnecessary discomfort or life-threatening withdrawal complications. Mild—Anxiety, headache, insomnia, tremor, palpitations, gastrointestinal disturbances. Moderate—In addition to the relatively mild symptoms above, some individuals may develop hyperthermia (elevated body temperature) and diaphoresis (sweating), tachycardia (rapid heartbeat), increased systolic blood pressure, tachypnea (rapid, shallow breathing), and some confusion. Severe/Delirium Tremens—As symptoms progress in severity, individuals may begin to become disoriented and experience impaired attention, visual and/or auditory hallucinations, seizures. A full range of alcohol withdrawal symptoms may persist for as little as a few hours up through several weeks after withdrawal has begun. The most severe symptoms commonly develop as many as two to three days after the last drink.1,3 In many cases, symptoms will largely begin to decrease and altogether resolve within 5-7 days. If you suspect you or someone you know is experiencing this form of withdrawal, seek medical attention immediately. 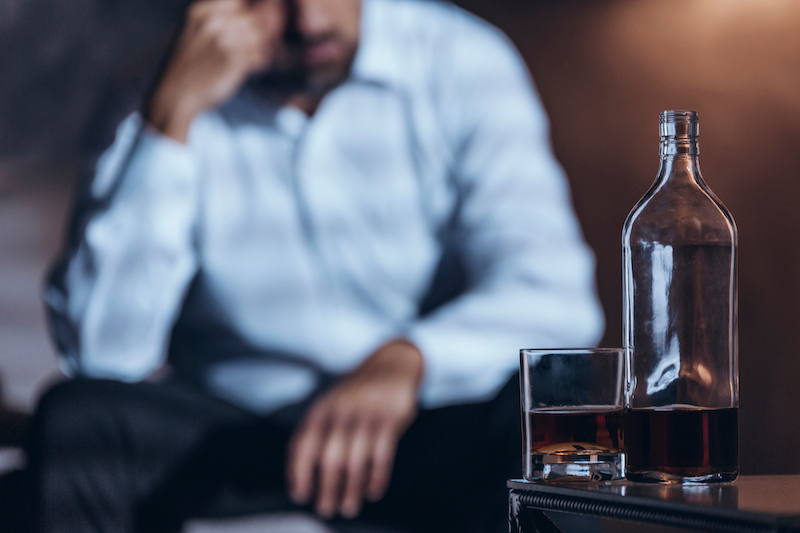 The type of detox program or level of intensity needed for effective alcohol withdrawal management will depend on the severity of the addiction, the magnitude of alcohol dependence, and the risk of experiencing a complicated withdrawal. A doctor or other treatment professional may evaluate for the above factors prior to making a recommendation for the level of detox care needed to keep a person safe and comfortable. Outpatient detox for alcohol withdrawal may be an adequate level of care for people at low risk for severe withdrawal. Withdrawal progress is monitored through frequent check-up appointments within outpatient clinical settings (e.g., doctor’s office), allowing for the level of care to be escalated if needed. Offering the most intensive level of care available, this detox option—which may include intensive care units in a hospital as well as acute psychiatric inpatient care settings—may be required for people at risk for, or already experiencing, severe withdrawal.7 Emphasis is placed on vigilant patient monitoring and the initiation and subsequent tapering of medications used to manage withdrawal and decrease the risk of complications. Following successful completion of detox, an inpatient or outpatient rehabilitation program may be recommended to allow further work toward recovery and relapse prevention. Group therapy, individual counseling, family counseling, support group meetings, wellness activities, and medication treatments may be included as part of a comprehensive treatment plan for alcohol use disorders. Behavioral therapies can help those struggling with alcohol abuse focus on avoiding old patterns and identify the root causes of addiction.
. Bayard, M., Mcintyre, J., Hill, K.R., Woodside, J. Alcohol Withdrawal Syndrome. American Family Physician 69(6): 1443-1450.
. Kattimani, S. and Bharadwaj, B. (2013). Clinical Management of Alcohol Withdrawal: A Systematic Review. Ind Psychiatry; Jul-Dec 22 (2); 100-108.
. Hugh Myrick, M.D., and Raymond F. Anton, M.D. (1998). Treatment of Alcohol Withdrawal. Alcohol Health & Research World 22(1): 38-43.
. Rahman A, Paul M. (2018). Delirium Tremens (DT). U.S. National Library of Medicine.
. Herbert L. Muncie Jr., M.D., Yasmin Yasinian, M.D. Linda Oge', M.D. (2013). Outpatient Management of Alcohol Withdrawal Syndrome. Am Fam Physician 88(9): 589-595.
. MedlinePlus (2016). Alcohol Withdrawal.
. Substance Abuse and Mental Health Services Administration. (2006). Detoxification and Substance Abuse. Treatment Improvement Protocol. (TIP) Series, No. 45. HHS Publication No. (SMA) 15-4131.